The winter transfer window is set to open in less than three weeks’ time and Manchester United have been linked with the signing of a number of players. One of those is Arsenal playmaker Mesut Ozil, who is heading into the final six months of his contract at the Emirates with no sign of him extending his current deal. The German superstar has been strongly linked with a move to both Manchester United and Barcelona in recent months and now the Daily Mail are reporting that the 29-year-old favours a move to Old Trafford over the Spanish giants. However, Gunners boss Arsene Wenger confirmed earlier this week that his side are still negotiating with Mesut Ozil in hope they can agree on a deal with the player this month. Should the playmaker not sign a new contract before New Year then he is free to discuss a contract with a foreign club to join in the summer. Ozil has previously rejected Arsenal’s offer of £235,000-per-week with the 2014 World Cup winner believed to want closer to £300,000 – a wage he could well get by moving on a free transfer where his future club would not need to shed out a transfer fee. 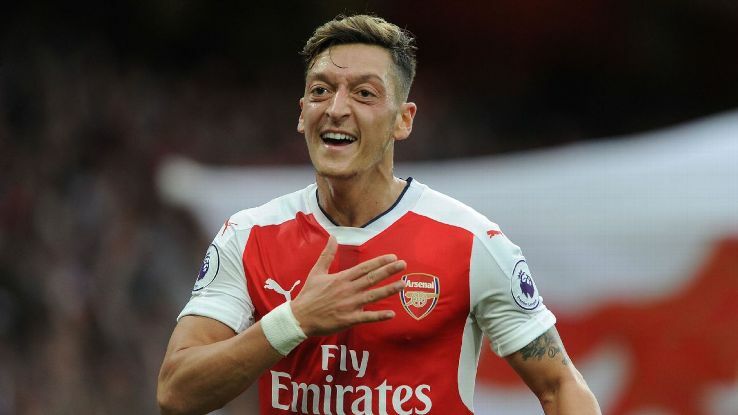 The report in the Daily Mail claims that Mesut Ozil has made it clear to friends that he is eyeing a move to Arsenal’s Premier League rivals Manchester United. Jose Mourinho previously signed the German international for Real Madrid after the 2010 World Cup and Ozil subsequently went on to become one of the best playmakers in the world working under the Portuguese coach. Ozil has been hit and miss during his time at Arsenal since joining for a then club record in 2013. He could certainly get a place in our starting lineup given that Henrikh Mkhitaryan has been a flop in the number 10 role for us, and Jesse Lingard is inconsistent there. Mourinho rarely plays Juan Mata in that role. Should we make a move for Mesut Ozil in January he would command a transfer fee. We can only sign him on a free transfer at the end of the season should he not agree a deal with Arsenal or another club. At the start of the month the Telegraph reported we’d need to pay our Premier League rivals £20-25m to land our target in January. Pay up for him in January. Smart move for Mario. And get Rinaldo in summer.